This collection by product designer Bilge Nur Saltik and design-duo Rive Roshan consists of a range of fine printed silks and glass sartorial objects. Presented last week at Istanbul Design Week as part of the No Borders exhibition, the collection ‘Through the Looking Glass’ comprises of fine silk scarves and handkerchieves and handmade glass scarf rings, exploring the relationship between intricate patterns on the silk and the playful lenticular effect of the rings. 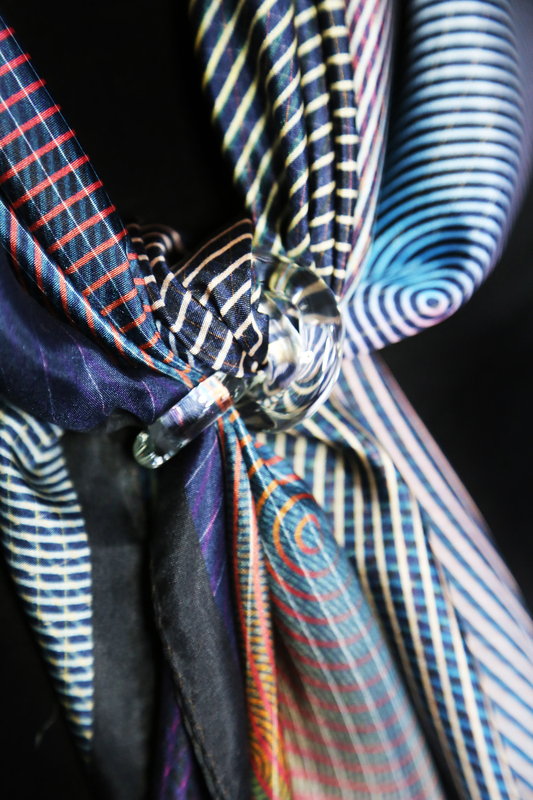 When the scarves and rings are worn together the glass rings create surprising and expressive refraction of shape and colour. The collaboration follows from a wish to bring together the interests and backgrounds of the three designers. Nur Saltik continued the exploration of distortion through glass that she started in her graduation project Op-jects at the Royal College of Art. Ruben de la Rive Box and Golnar Roshan, who met whilst working in the studio of Marcel Wanders and recently formed the brand Rive Roshan, wanted to create visual stories that would explore optical illusions and mimic natural structures. The silk scarves have been digitally printed in England and the scarf rings have been hand made by glass makers in Istanbul.